Has your smile lost its luster over the years? If tooth discoloration has caused your teeth to appear dull and yellow, you have probably given a few over-the-counter products a try, but they left you feeling disappointed because they did not work. You are not out of options. 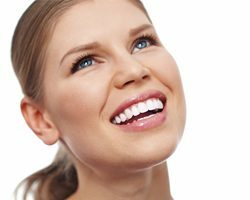 Dr. William J. Twohig has the solution you need with professional teeth whitening in Weyauwega. He takes a whole-body approach to provide you with the treatments you need to improve your confidence while keeping your general well-being in mind. You cannot avoid tooth discoloration. As your enamel becomes thinner, your teeth will naturally darken over time; however, the severity of the color change is influenced by several factors. If you tend to drink coffee, eat berries, or consume other darkly pigmented foods and drinks, your smile can become stained. In addition, poor oral hygiene habits and smoking also lead to a yellow or brown appearance. To combat the changes, there are many over-the-counter products available. They are affordable and convenient, making them appear to be the ideal answer to your problem. Unfortunately, you will not achieve the results you want because they do not contain a professional-strength whitening agent. Not to mention, many of them contain several questionable chemicals. Now, you can safely and effectively restore a youthful smile with your cosmetic dentist in Weyauwega, Dr. Twohig. Dr. Twohig uses the Kor whitening system to reverse the appearance of dark stains and discoloration. Unlike other systems, it does not use lasers or lights. Instead, a specially formulated gel is applied to penetrate your enamel to break up even the most stubborn stains. While it whitens your smile, it does more than just brighten your teeth. It also strengthens them in the process to promote your oral health overall. After ensuring that you are a candidate for teeth whitening, Dr. Twohig will create a customized treatment plan. A special barrier will be placed on your gums and lips to prevent any irritation to the soft tissues. The gel is then applied to your teeth using specially designed trays. As the gel is activated, it will restore your enamel back to its youthful appearance. 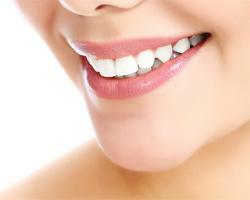 Your teeth will become several shades whiter after just one treatment. With the right aftercare, they will stay bright for lasting results. To prevent future discoloration, it is best to remain proactive about your smile. In addition to brushing twice a day and flossing every night, do not forget to visit your dentist twice a year for a cleaning and checkup. When eating or drinking darkly pigmented foods and drinks, brush your teeth immediately afterward. If you cannot, rinse your mouth with water. If you smoke or use tobacco, it is best to stop right away. 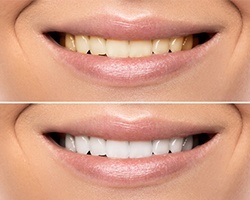 Do not let dark tooth discoloration hurt your confidence any longer. Get the bright smile you deserve with a safe, effective teeth whitening solution today! Contact our office to schedule your consultation.